Warm weather and blue skies are making it easy to spend a lot of time out on deck, looking for wildlife! 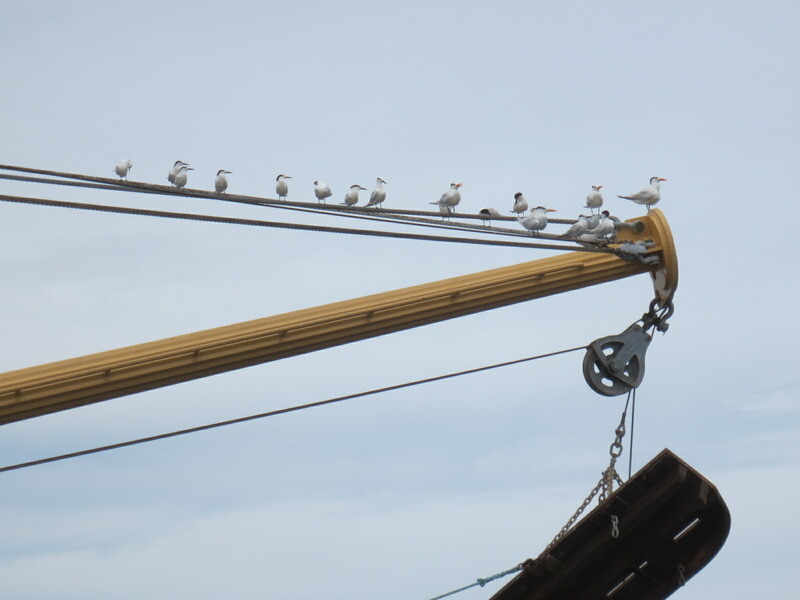 In addition to the lazy seagulls who keep hitching a ride on the ship’s trawling gear, we continue to spot dolphins, flying fish, and even a shark feeding frenzy! The organisms in each catch provide a snap shot of the marine life in one location in one moment in time. It’s interesting to see what we catch, but there are not many scientific conclusions that we can draw based on what we see in just 10 days. However, this survey has been completed twice per year (once in the summer and once in the fall) for over 35 years. 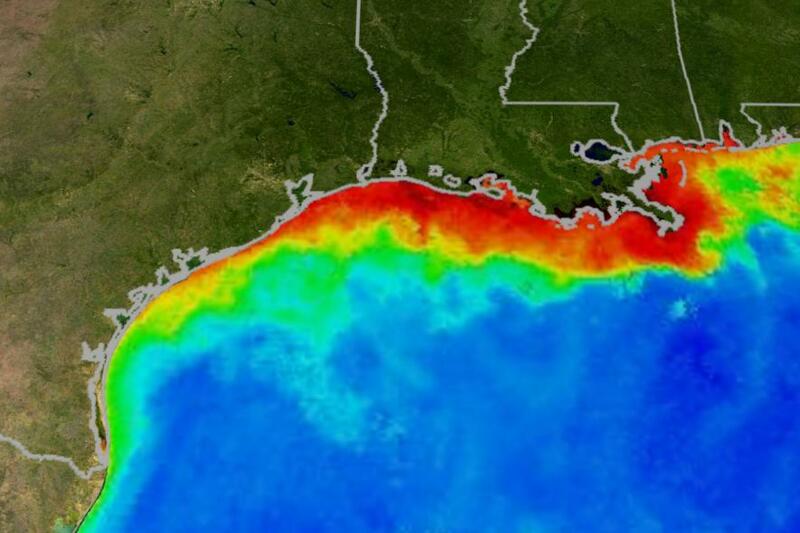 It is looking at trends, or changes and patterns over time, that allows scientists to draw conclusions about the health and ecology of the Gulf of Mexico. One of the major practical applications of this research is to prevent overfishing, the removal of too many individuals from a population causing that population to become unstable. Continued overfishing can lead to the extinction of a species because it leaves too few mature individuals to reproduce and replace those that are removed. One famous example of overfishing and its consequences occurred in the late 1980’s off the Atlantic coast of Canada. Cod was a major food source and commercial industry in the provinces of Newfoundland and Labrodor. 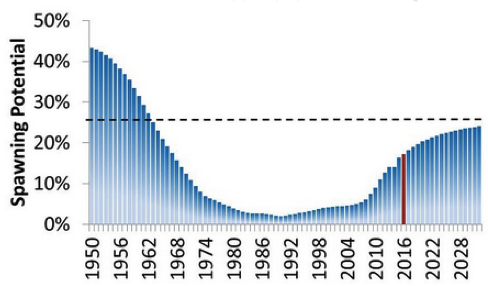 However, unregulated overfishing depleted the cod population and, between 1988 and 1992 the cod population crashed, losing more than 99% of its biomass – they were essentially gone. This destroyed the industry, putting over 40,000 people out of work. 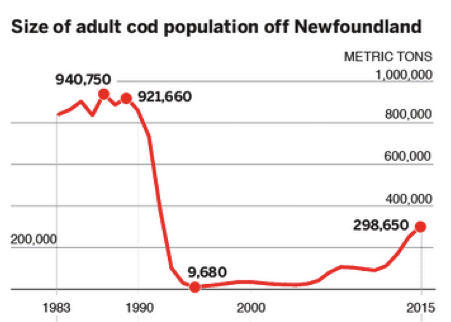 In 1992, the government finally imposed a complete ban on cod fishing in hopes that the cod population could still recover. The fishing ban is still in place today, though just last year, Canadian scientists released a report stating that there are some signs of hope! When NOAA scientists notice overfishing occurring in US waters, they can recommend that protective regulations, or rules, are put in place to limit or even stop fishing in an area until the species has had a chance to recover. Here are a few examples of the types of regulations that have been created in the Gulf of Mexico in response to the data from the Groundfish Survey. 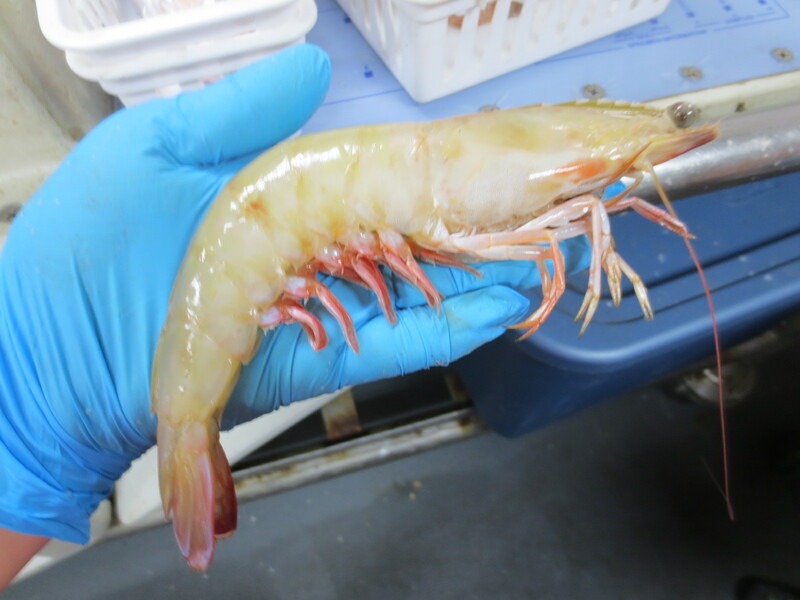 The Texas closure runs each year from about May 15 to July 15, though the exact dates vary depending on the health of the shrimp population that year. This break allows the shrimp time to mature to an age at which they can reproduce, and to migrate out to deeper waters, which is where females spawn. It also allows the shrimp to grow to a size that is more commercially valuable. A shrimp we caught off the coast of Florida. 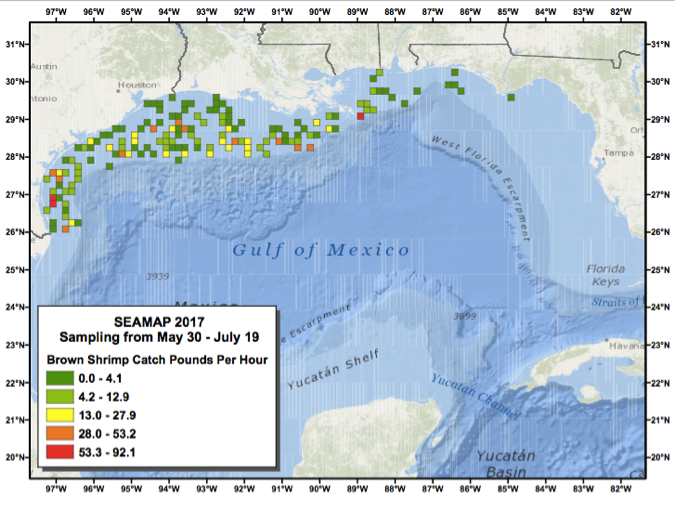 In addition to sending out an annual notice to fisherman of the dates of the Texas Closure, NOAA also makes all of the shrimp survey data available. This can help fishermen to target the best fishing locations and work efficiently. For example, this is a plot showing the amount of brown shrimp found at various locations, created using this year’s survey data. Another species that is currently under regulation is the red snapper, which has been a popular seafood in the US since the 1840s. As fishing technology improved and recreational fishing expanded in the 1950’s, the number of red snapper captured each year increased dramatically. The shrimp industry was also expanding rapidly at this time, and juvenile red snapper were often accidentally caught and killed in shrimp trawls. As a result of these three pressures, the red snapper population began to decline dramatically. By 1990, the spawning potential, or the number of eggs produced by the population each year, was only 2% of what it would have been naturally, without any fishing. This was far below the target spawning potential level of 26% that is necessary to sustain the species. its normal age structure. 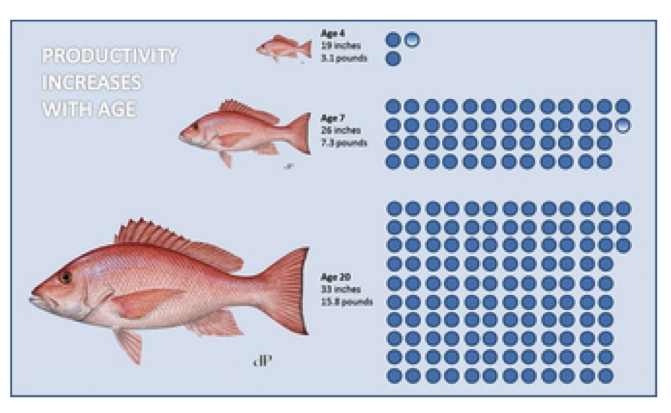 Currently, the majority of red snapper found in the Gulf are less than 10 years old. These fish are still juveniles capable of producing only a fraction of the offspring a fully mature individual would produce. It is important to continue to closely monitor and regulate the fishing of snapper until both the number and age of individuals has been restored to a sustainable level. 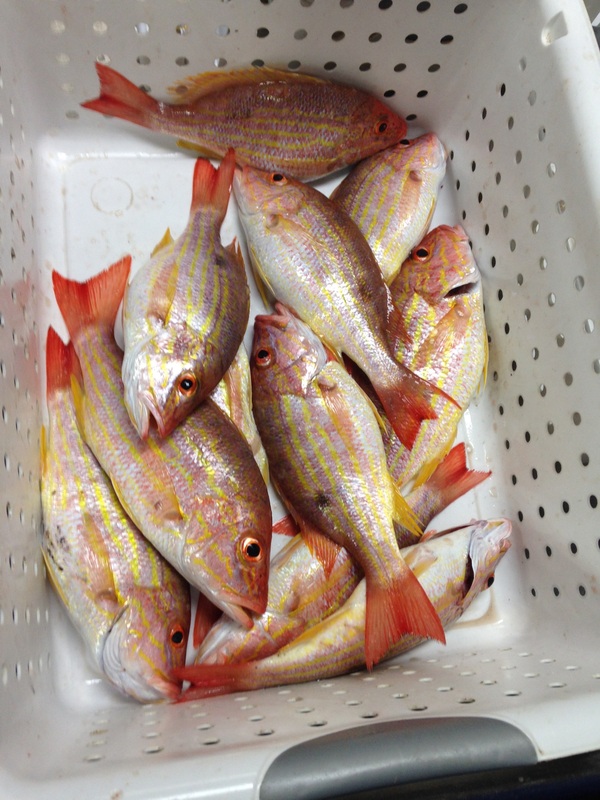 We were fortunate to catch members of three different species of red snapper during my leg of the survey. I did notice that most of them were relatively small – less than 10 inches – which is consistent with the concern that the population is still disproportionately young. As with the shrimp, we collected more detailed information about these individuals. We also removed the stomachs of a sample of snappers. 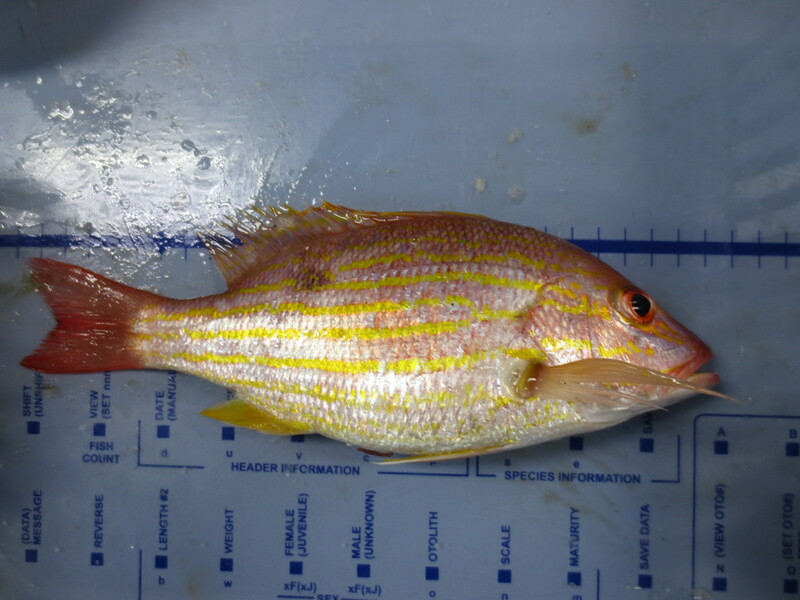 As I discussed in my last blog (“What Tummies Tell Us”), scientists back on land will examine the contents of their stomachs as part of a diet study to better understand what snapper are eating. Because the invasive lionfish has a competitive relationship with red snapper, meaning that it eats many of the same foods that red snapper eat, fisheries biologists are concerned that red snapper may be forced to settle for alternative and/or reduced food sources and that this could also slow their recovery. A typical red snapper from our catch. Note that each mark on the ruler is one centimeter. Red snapper from one catch. Getting ready to deploy the CTD sensors. One of the measurements the CTD takes is the amount of oxygen that is dissolved in the water. This is important because, just like you and me, fish need to take in oxygen to survive. (The difference is that you and I use our lungs to remove oxygen from the air, whereas fish use gills to remove oxygen from the water!) When dissolved oxygen concentrations in the water drop below 2 mg/L, a condition called hypoxia, most marine organisms cannot survive. When waters become hypoxic, organisms that are able to migrate (like some fishes) will leave the area. Organisms that cannot migrate (like corals or crabs) will die from lack of oxygen. This creates large areas of ocean, called dead zones, that are devoid of typical marine life. Often anaerobic microorganisms, some of which are toxic to humans, will then grow out of control in these areas. Not only is this stressful for the marine populations, it hampers regular fishing activities, and can even pose a threat to human health. 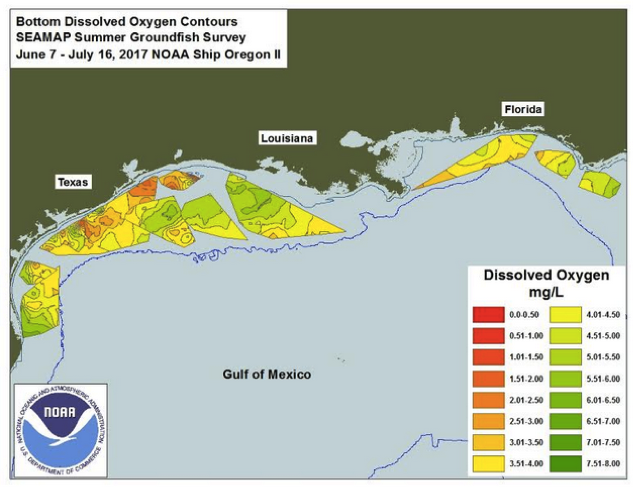 The Gulf of Mexico is home to the largest hypoxic zone in US waters. Nitrogen-rich fertilizers and animal waste from farming activities througho ut the Midwest United States all collect in the Mississippi River, which drains into the Gulf. Though nitrogen is a nutrient that organisms need in order to grow and be healthy, excess nitrogen causes an imbalance in the normal nitrogen cycle, and stimulates high levels of algae plant growth called an algal bloom. Once the algae use up the excess nitrogen, they begin to die. This causes the population of decomposers like fungi and bacteria to spike. Like most animals, these decomposers consume oxygen. Because there are more decomposers than usual, they begin to use up oxygen faster than it can be replenished. This hypoxic zone is largest in the summer, when farming activities are at their peak. In the winter, there is less farming, and therefore less nitrogen. As the hypoxic water continues to mix with normal ocean water, the levels of oxygen begin to return to normal. (When there are tropical storms or hurricanes in the Gulf, this mixing effect is more significant, helping to reduce the impact of the hypoxia. This is often the primary cause of low-hypoxia years like 2000.) Unfortunately, the average size of the annual dead zone remains at nearly 15,000 square kilometers, three times the goal of 5,000 square kilometers. The data collected from this year’s Groundfish Survey was used to create this map of hypoxic areas. How might this map be different if tropical storm Cindy had not occurred this summer? A plot of dissolved oxygen levels created from this year’s survey data. The data we collect on the Groundfish survey is combined with data gathered during other NOAA missions and by other organizations, like NASA (the National Aeronautics and Space Administration) and USGS (the United States Geologic Survey). By collaborating and sharing data, scientists are able to develop a more complete and detailed understanding of hypoxia levels. These EPA regulations were only recently implemented, so it is still unclear what, if any, impact they will have on the hypoxic zone in the Gulf. It will be interesting to keep an eye on the data from the Groundfish survey in coming years to help answer that question! In the mean time, though, things still seem to be moving in the wrong direction. In fact, NOAA just announced that this summer’s dead zone is the largest ever recorded. Getting a PhD in your chosen field of science is an awesome accomplishment and is necessary if your goal is to design and carry out your own research projects. However, I’ve noticed that the PhD is often presented to students as the only path into a career in science. I think this is unfortunate, since this often discourages students who know they do not want to pursue a graduate degree from entering the field. I’ve noticed that most of the scientists I’ve met while on board the Oregon II and in the NOAA lab at Pascagoula do not hold PhDs, but are still deeply involved in field work, lab work, and data analysis every day. Now, Andre tries to help others navigate the tricky career path into marine biology. In addition to his responsibilities as a biologist, he is also the Outreach and Education Coordinator for the NOAA lab, which allows him to mentors all of interns (and Teachers at Sea like me!) and to talk with students at schools in the community. If you’re interested in pursuing a career in marine biology, it’s never to early to start looking for some of those volunteer opportunities! There are lots of scientists out there like Andre who are excited to share their knowledge and experience. The Day-Shift Science Team as we head back in to port. 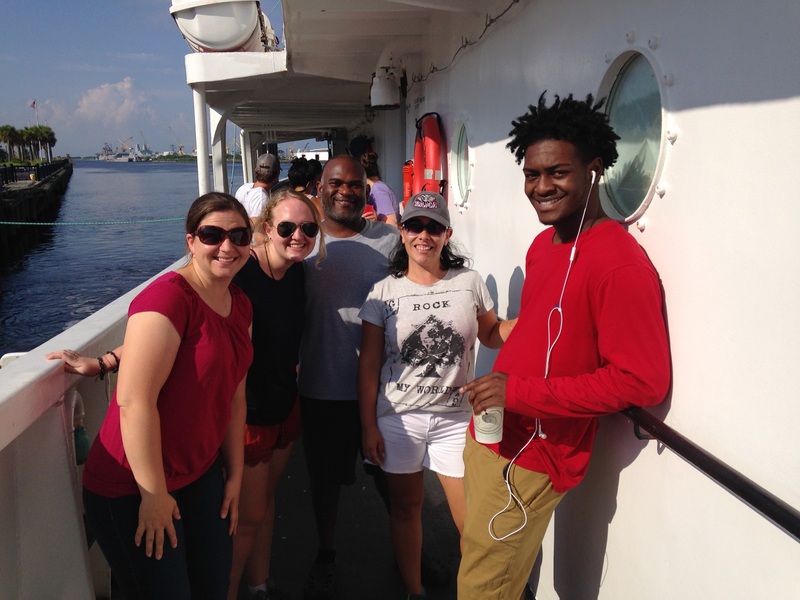 From left to right: TAS Anna Levy, NOAA Summer Intern Jessica Pantone, NOAA Biologist & Field Party Chief Andre DeBose, NOAA Fellow Dedi Vernetti Duarte, NOAA Volunteer Elijah Ramsey. In the Gulf of Mexico, each state has the authority to regulate the waters that are within about 9 miles of the coast. (This includes making rules about fishing.) Beyond that, the federal government, with the help of federal agencies like NOAA, make the rules! Research: This article discussed the political side of the Snapper situation. Research other news articles about this issue to ensure that you have a balanced perspective. Reflect: To what extent do you believe this issue should be governed by science? To what extent do you believe this issue should be governed by politics? Take action: Propose some specific ways that fisherman, scientists, and policy-makers could work together to address issues like the overfishing of red snapper fairly and effectively. 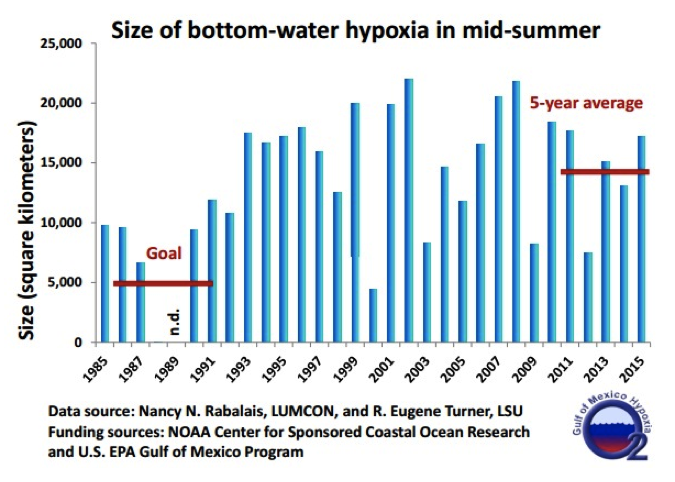 Review: Examine the graph showing the size of the hypoxic zone in the Gulf each summer. There are unusually small zones in 1988 and 2000. How do you explain this? 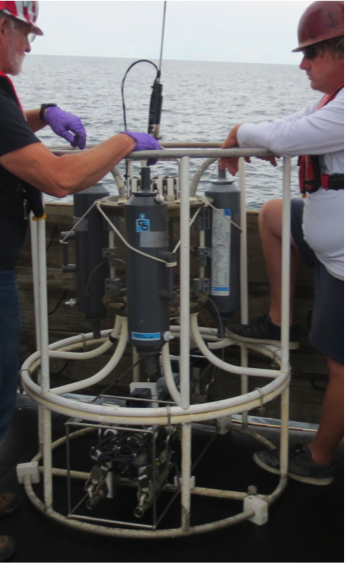 Research: Two other reoccurring hypoxic zones in the US are found in Chesapeake Bay and Lake Erie. What is the cause of each of these zones? This entry was posted in 2017, Anna Levy, NOAA Teacher at Sea and tagged Careers, CTD, Dead Zone, Gulf of Mexico, hypoxia, NOAA Ship Oregon II, overfishing, shrimp. Bookmark the permalink.